Celebrating 40 years of excellence ! "Paul designed the 60” one-piece back in the early 70’s when he first began building bows. The one-piece interest died some in the late 80’s but Paul still built them up until his death in 1993. I have continued to build the 60” model and also added the 58" to my line." 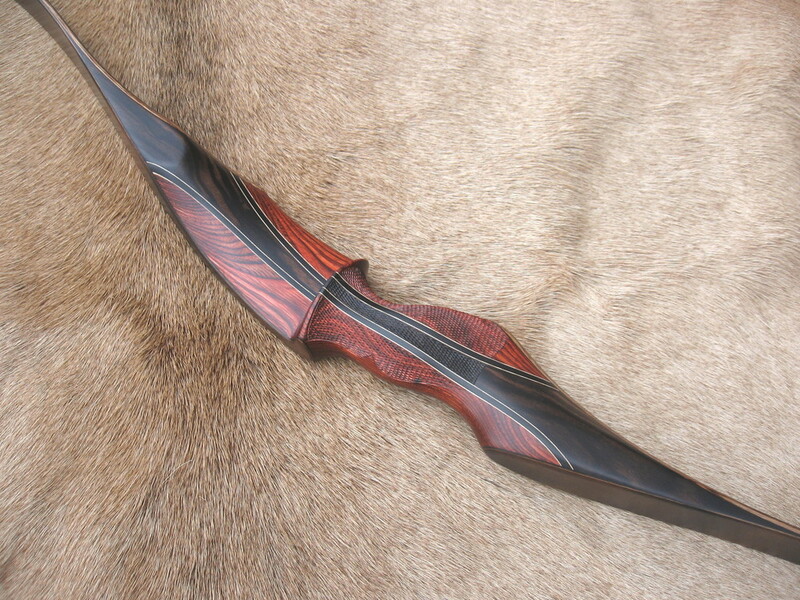 Shedua Riser with koa limbs. All Silvertip One- Piece limbs have an Actionwood core (laminated maple) reinforced with a woven fiberglass lamination. This process ensures durability, great stability, smoothness and consistency in a limb. Though Actionwood is preferred, other core woods can be used upon request. The standard limb comes with black or clear glass. The standard clear glass option would include the Actionwood core stained to match the riser of your choice. Black glass would be solid black with no core wood showing through. In addition, there are many limb veneer woods to choose from. These are very thin domestic/exotic hardwoods which lie between the core and glass and are primarily used for aesthetic purposes. All veneers will offer the same superior performance. Some common limb veneers are pictured below and others may be used upon request. Veneers can be stained of left natural depending on the look you are after. Darker veneers tend to show more imperfections in the glass, therefore lighter woods would be preferred for a cleaner look. The standard tip overlay is wood with additional options of antler and various horns. The Silvertip is also offered in a Fast Flight model available only with the standard Dymondwood risers. These bows include reinforced tips and riser. Testing has found an 8fps gain using FF comparable strings. The same limb and limb tip options mentioned above apply to these models. Please note that the Fast Flight models all have FF on both the riser and limbs. Be aware of this if you acquireused Schafer equipment and be sure to use the proper string material. The standard riser wood is Dymondwood offered in a walnut, rosewood or charcoal stain. Dymondwood is a laminated birch impregnated with dyed resins, providing an extremely durable and heavier physical weight bow. Additional riser options would include domestic/exotic hardwoods many of which are pictured on this website. Others areavailable upon request. Exotics have proven to be very durable under all conditions and add nice character to a bow. Each Silvertip comes standard with a straight laminated accent stripe in the riser for strength. We also offer other riser configurations which can be found on the "Custom Options" tab. Silvertips come with a standard matte finish unless requested otherwise. There are three grip options. A high grip lifts the heel of your hand, straightening your wrist; a low grip drops the heel of your hand; the medium grip is in between andby far, the most popular. Including a trace of your hand with your order can help determine the proper grip for you. 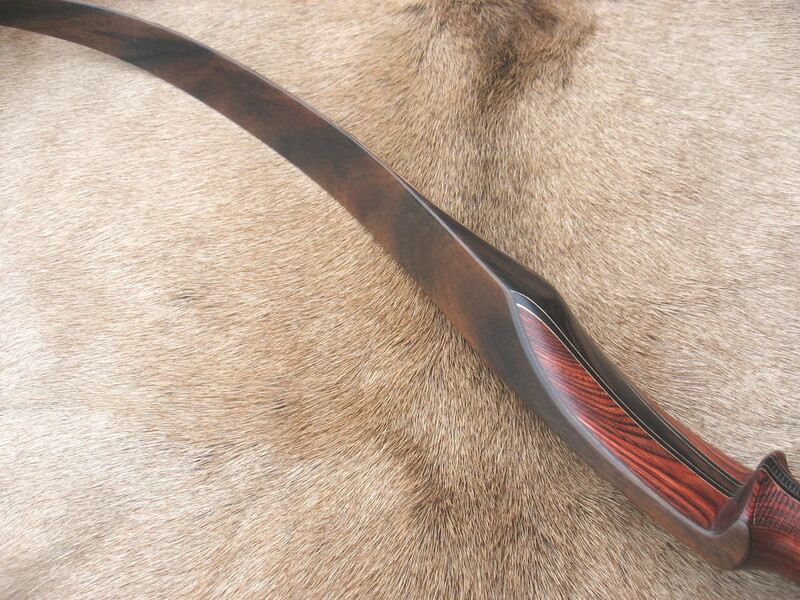 Grip modifications can be made providing the specifications are adaptable the the design of the bow. The site window and shelf are radiused front to backfavorable for shooting feathers off the shelf and vanes or feathers offthe rest. All Silvertips come with a string, bow stringer, shelf or rest material and can be tapped for a bow quiver free of charge. The checkered grip is a functional and beautiful option for all hunting conditions. In wet weather or with a glove it definitely provides a better grip and also aids in consistent hand placement. All the same materials and options that are offered on our other bow models also apply to the one-piece models. Please refer to all the photos on this site regarding these various options. Since no two Silvertips are alike, please enjoy viewing the slideshows below showcasing the many unique and beautiful wood combinations our customers have created. Locating special woods has become a full time job in itself. We do have a growing number of customers who actually have the time and enjoy this process. This is fine but be sure to get a detailed list of dimensions from us and then please confirm the purchase with us either by description or picture to be sure it's a suitable piece for us to work with.